The Treemap Add-in for Excel adds treemap data visualization functionality to hierarchical structured data in Excel. Treemaps display hierarchical data as a set of nested rectangles where each branch of the tree is allocated a rectangle which is tiled with smaller rectangles representing sub-branches of data. A leaf node's rectangle has an area proportional to a specified dimension on the data and leaf nodes can be colored to show a separate dimension of the data. The Treemap Add-in for Excel can create treemap visualizations quickly and easily from a menu option in Excel 2003 and earlier and as a new ribbon tab in Excel 2007 and later. Squarified or Best Fit Direction: option to choose between squarified or best-fit rectangle dimensions for created treemap. M x N Input Data Range: the input data can span across multiple columns and rows. Draw Colored or Black and White: draws the treemap in color or in black and white. Color at specific Level: option to color the treemap nodes at any specified level from the 1st to the N (maximum) level. Color Using Custom or Excel’s Built in Palette: option to use either a custom palette or the default excel palette to color the treemap. Named or without Names: ability to draw treemaps with or without names being assigned to nodes. Name at specific Level: ability to specify names to appear only at the specific level. Add Parent Name to Name: option to add the parent name to the child nodes. Size: specify the size of the treemap to fit requirements. Position: ability to automatically position the treemap in the worksheet. Header or no Headers: option to plot with or without data headers. Plots All Nodes: All nodes are drawn even if hidden below the child nodes. Call From Outside Procedures or Functions: integrate the treemap by calling the TREEMAP function from other modules and supplying the parameters. Proportionate Borders: the border of a node in the treemap will be proportionate to the level of the node. Tool tips - When you hover over a node, the tool tips provide useful information about the node. 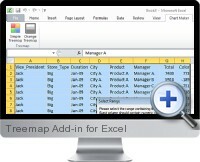 (Click the EXCEL TREEMAP menu item at the top of the next page to access this product).